When Los Angeles Lakers owner Jeanie Buss instilled Magic Johnson as president of basketball operations, he made it clear to head coach Luke Walton that the team needed to improve on the defensive end of the floor. Under Byron Scott during the 2015-16 season, the Lakers were last in the league in defensive rating. They remained there the following year under Walton. But this season, the Lakers allowed 105.6 points per 100 possessions, good for the 12th ranked defense in the NBA. “The overall goal that I’m most proud of is we finished 12th in defense. We were 30th last year and I think 29th the year before that,” Walton said during his exit interview. Through the first four weeks of the season the Lakers boasted the NBA’s fourth-best defense. They were eighth overall heading into December. But injuries began to pile up, leading to a slippage on defense and a nine-game losing streak during the final calendar month of 2017. 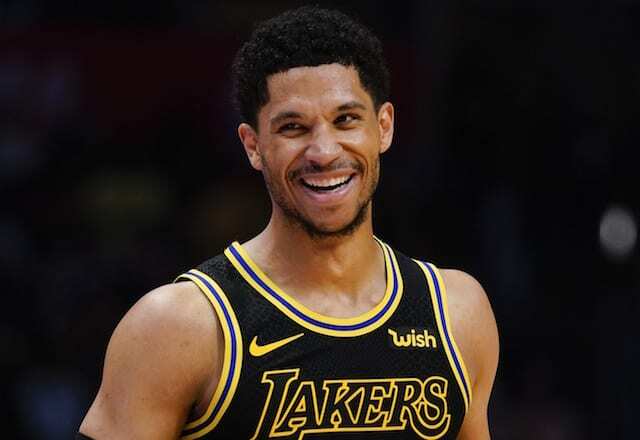 It was one of the many challenges Walton and his team endured throughout the season, which makes not only their defensive rank but 35 wins all the more notable accomplishments. “When we were on that nine-game losing streak we didn’t give in, we pulled together. We stuck together and we came out stronger on the other side, starting winning a lot of games,” Walton said. Like with his team, Walton is aware there’s plenty of room for growth and improvement on a personal level. With that comes learning what best suits the players and how Walton can maximize their potential. “There’s a lot of areas that I’ve grown and there’s a lot of areas I’m going to continue to grow as a young coach. Like I’ve said about our players, there’s no substitute, there’s no shortcut for experience. That’s for me too. I’m going through a lot; trial and error,” he said.